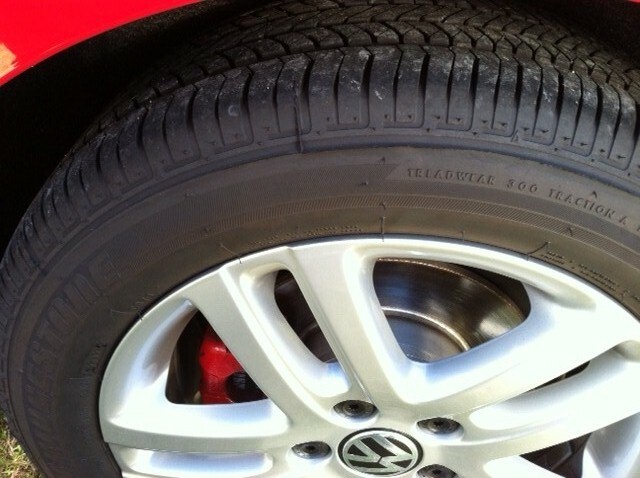 How often do you drive around and wonder if your tires are over-inflated or under-inflated yet do nothing about it ? Or stop at one of those gas station air machines to add extra air, just in case. You could be on the verge of a tire blow-out and not even know it ! Given the inconsistent temperatures that we have experienced lately and of course, as the seasons change, this takes a toll on the air pressure in our tires as well. Consult your vehicle owner’s manual or look for the sticker in the driver’s side door jamb to determine the manufacturer’s standard cold tire inflation pressure. This number is the lowest PSI (pounds per square inch) to inflate your tires. Tire experts say that tire pressure decreases 1-2 lbs for every 10 degree drop in temperature so it is best to check tire pressure before you do a lot of driving & heat up the tires. Tires set at an incorrect pressure, whether over or under-inflated, can have damaging effects. Under-inflation causes increased treadwear on the outside edges of a tire, generates excessive heat (which reduces durability of a tire) and can decrease fuel economy by increasing rolling resistance since “soft” tires make your vehicle work harder. Over-inflation causes increased wear on the center track of a tire and can lead to loss of traction or possible tire blow out = unsafe. Keep in mind that the rubber on your tires is what meets the pavement, keeps your vehicle moving forward and you & your family safe as you drive down the road. Get into the habit of having your tire pressure checked regularly so that variations can be noted and adjusted accordingly. Do not rely on “eyeballing” it…..and remember that your owner’s manual or door sticker recommendation is for the vehicle’s original set of tires. When you install new tires, PSI numbers will most likely change. Whether you are driving a VW, Audi or any other make & model, maintenance is key and necessary. Bring your vehicle into Das Autohaus so that your tires and their pressure can be professionally monitored. Don’t wait until it is too late !